30 years ago yesterday, the original Star Wars took America by storm, ushering in a new era of summer blockbusters and capturing the imagination of young and old alike. It has since spawned sequels, prequels and a media empire that is still going strong today. 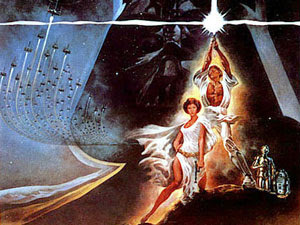 Opening on a scant 32 screens, Star Wars introduced the world to a simple yet wholly unique tale of an ultimate good, an ultimate evil and a yearning for adventure. Much like protagonist Luke Skywalker, the audience was thrust into the film's galactic civil war with only the slightest exposition; an opening crawl of yellow text describing the key players in the film and where we were in the story. Referred to as "Episode IV" of the saga following its release, Star Wars gave audiences just a glimpse into a universe that was far larger than the film itself. Creator George Lucas has revisited this beloved series five times since, filling us in on the rest of the story, but one may argue that it was the vague history that the film alludes to that was so fascinating. What were these Clone Wars, and and what was this "Old Republic" that aged hermit Obi-Wan Kenobi refers to? Of course now we know all of this, but 30 years ago, on May 25, 1977, the story flickering on those 32 screens needed no explanation, imaginations took over, and an entire generation was hooked. While Star Wars appears on everything from bed sheets to video games to, yes, even postage stamps, it all began with Lucas, and his ambitious desire to infuse the sensibilities of movie serials of the 1930s and 40s with a grander sense of mythology, inspired by luminaries such as Akira Kurasawa and J.R.R. Tolkien. Millions of dollars later, it's safe to say that his ambition paid off. With Memorial Day upon us, take the time to revisit this classic film and celebrate what it means to you, whether it be childhood nostalgia or a lifelong obsession. And introduce it to someone new, while you're at it. Oh, and may the Force be with you. You knew that was coming.